A historic Scottish steam engine has made a 6,000 mile journey home to help a fundraising campaign for Glasgow's new Riverside Transport Museum. Locomotive 3007 arrived on Friday morning after 60 years in South Africa and once restored will become the centrepiece of the new attraction. It has gone on display in George Square as part of an appeal to raise £5m of the museum's £74m costs. The move from Kelvingrove to the Clyde is planned for completion in 2010. 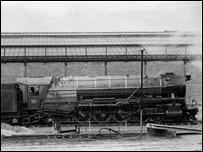 The 15F class Locomotive 3007 was designed and built in Polmadie in 1945 and was the backbone of the South Africa Railways during the age of steam. It pulled passenger and freight trains until 1988. 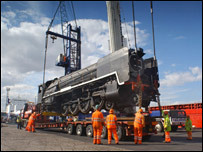 Completing the final leg of its journey, the locomotive travelled by road on Thursday evening - from Immingham Docks, near Hull, to Glasgow. Actor Robbie Coltrane, who is a trustee of the Riverside Museum appeal, welcomed the train to Glasgow along with Carol Smillie. Rail and bus operator FirstGroup is patron of the appeal and is helping fund the transport and restoration of the locomotive. Chief executive Moir Lockhead said its return to Glasgow would give new generations the chance to see an example of the "rail revolution" Scotland gave to the world. He said: "Glasgow's transport collections are of international importance and it is fitting that Locomotive 3007 will be at the heart of the new museum." Sir Robert Smith, chairman of the appeal, said: "It is so fitting that the return of this magnificent engine should mark the formal launch of the Riverside Museum appeal. "It is such a powerful symbol of Glasgow's proud transport and engineering heritage. "This city gave ships and locomotives to the world." Glasgow City Council and the Heritage Lottery Fund have committed to providing the remaining £69m of the new museum's costs.